I have been neglecting my hands. I have been so busy with work and life in general, that stopping to get a manicure has been impossible. 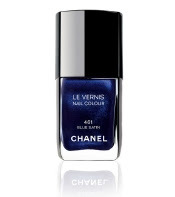 But here is something that will probably get me to a nail salon very soon: Chanel's Blue Satin Nail Polish. This color is plastered on every magazine and on every other beauty blog! And my will power has been fighting for too long and is now defeated: I want one. But here comes the tricky part. See, a Chanel's nail polish is kind of expensive to begin with, at $19 a pop. But this color is now sold out, and the vultures are out on eBay selling it even for $50, which is ridiculous! Is it possible that Chanel is the only brand that can produce this color? I've seen blue nail polish in the past, but most of the time it was unwearable. But maybe now, after the blue satin phenomenon, we might be able to find something very similar in another brand, and that won't cost us a fortune. This one from OPI looks like it could be a close match. The closest one from Essie is Aruba Blue. And the closest thing at the local drugs store is Revlon in Midnight Affair. Unfortunately, the only way to compare these colors to the original I am lusting after is to try them all, including the blue satin, which means going out and buying the blue satin anyway, which means I've just defeated the purpose of this whole post... oh well... who am I to argue logic? I feel your navy lust! You might want to try Zoya's Indigo...I'll be reviewing it soon on www.shinygloss.tv. Not to spam, but I'll have pictures you can check out. Ladies before you run out and buy this color (I have it) please understand that this shade of blue is DARK and to me looks exactly like black satin. It does not look as blue in person as it does online. If I knew this I would not have bought it. I'm very disappointed. I thought it would be more blue-er but on my hands it looks black and I am fair skinned. I am actually getting my hands on one of Friday (thank you Delphine!) so expect a real review soon. amethyst I'm sorry to hear that you didn't like it... I hope it looks blue on me. Maybe it needs just one coat? UPDATE: I got the color! 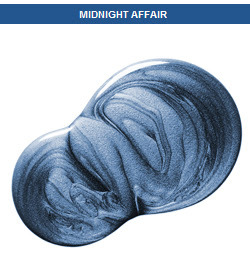 It does look blue, it is dark, but you can tell it's blue. It will look that much bluer outdoors on a sunny day (while it does look darker indoors). After all, it is a spring/summer shade and as such meant to be worn out there under the sun. It's available at Nordstrom.com (although on back order). OPI's Russian Navy is another low-cost alternative. so this is probably really tacky of me, but i got a pretty close match to the Chanel with cheap-o $1 N.Y.C. brand polish in 115A "Skin Tight Denim Creme" that I got at Target. hard to beat $1 if you can't get your hands on the real thing! you can buy a set on ebay! otherwise it just looks worn and dull after the first day. with azur on top its AMAZING!!! i put it on today and got so many flattering comments! I just bought it at Saks today. I love it! I got one of the last bottles though! http://hautecouturegirl.blogspot.com/ ~ Check out mine! I tried the blue satin on in Cusp (a local boutique here in the DC area that's an offshoot of Neiman Marcus) and didn't like it that much. One of the sales girls suggested Lippman's Nail color in Rehab. It's a sheer blue and that makes it a little more wearable. I really like it. In Australia, Chanel nail colour is $37 per bottle, so I only allow myself one bottle of Chanel per season--and this season was Rouge Noir. Had a look at Blue Satin but decided OPI's Russian Navy was more what I wanted--and I love it. It's a true indigo. OPI has another shade in their 'India' collection called 'Yoga-ta-get-this' or something like that; it looked a bit brighter.